Hi, I'm Amany, an Arabic / English writer and translator. I was born in Saudi Arabia and moved to Egypt 8 years ago. I hold bachelor degree in commerce (English section) Arabic...Read moreHi, I'm Amany, an Arabic / English writer and translator. I was born in Saudi Arabia and moved to Egypt 8 years ago. I hold bachelor degree in commerce (English section) Arabic is my mother tongue and I studied it very thoroughly in both Saudi Arabia and Egypt. 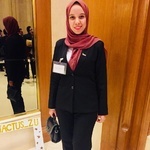 I work as an English presenter and script writer in Enactus | Egypt. I'm interested in learning new languages and cultural.